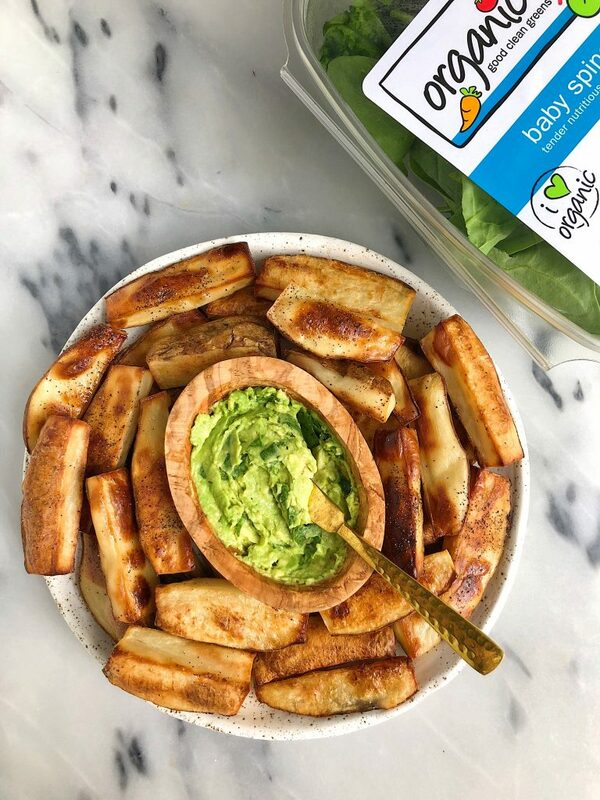 Crispy Baked Thick-Cut Fries made in the oven and paired with a delicious and healthy Supergreen Guacamole for an plant-based and gluten-free recipe! There is no such thing as too many french fry recipes friends. I cannot get enough of making all types of french fries like those Crispy Garlicky Sweet Potato Fries and Shoestring Sweet Potato Fries. But today we are switching things up a bit with a new potato in town. And by new, I mean I finally bought a potato that isn’t an organic Japanese sweet potato or orange sweet potato. I branched out of my usual routine at the store and got organic russet potatoes. And now I am obsessed. There is really not a potato that I don’t love to eat though. Coming from the girl who hated potatoes less than a year I ago… I know it is crazy. I also have been making a Supergreen Guacamole to dip my fries in, which is a game changer. 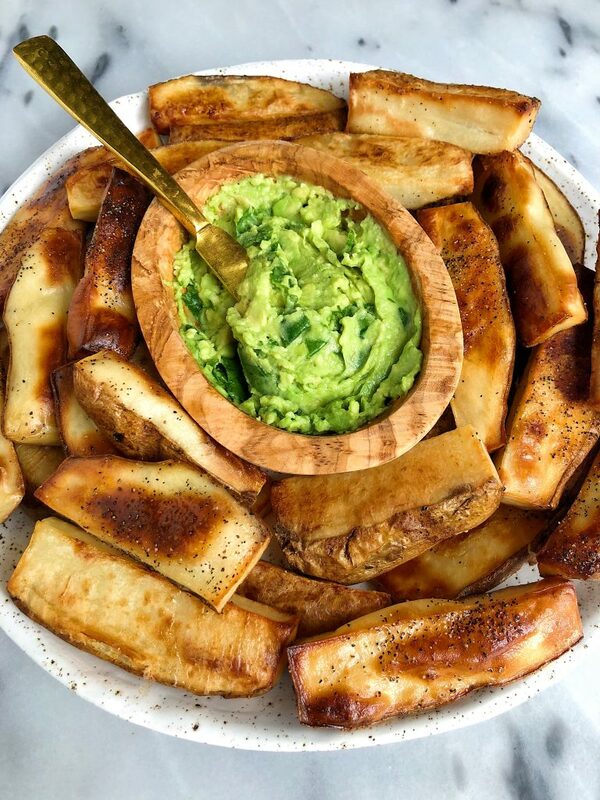 Of course I love using condiments and eating them plain, but dipping these thick-cut fries into Supergreen Guacamole is my dream savory combo right now. The Supergreen Guacamole is filled with 3 easy ingredients. One being the avocado (duh) then I also add in some chopped organic spinach and garlic. I use Organic Girl greens always and in this recipe, I use their baby spinach but really any works. Especially their new rebel greens that are absolutely deliciously crunchy and fresh. The garlic adds the perfect amount of seasoning but you can also add anything else like jalapeños, red pepper or anything you are craving. Hope you guys love this recipe as much as I do. Don’t forget to share with me over on Instagram! Here are a few of my other favorite Organic Girl recipes from the blog: The Ultimate Healthy Brownies, Avocado Greens Caesar Salad with Sweet Potato Croutons and Whole30 Loaded Veggie Burgers. 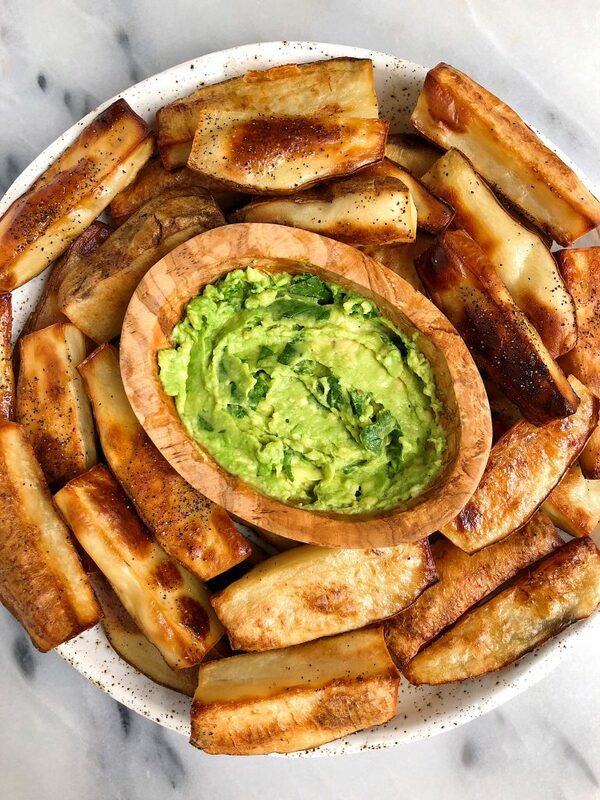 Dip fries into guac and enjoy! Store any leftover fries in the fridge for up to a week! Feel free to sub any potato you prefer. How much oil would I need for 1 sweet potato? Maybe 1/2 tbsp? Does to much oil make them soggy … I’m trying to learn how to prefect them so their are moist but crispy. Hey Rachel I have a question! So I’m trying to perfect making Japanese sweet potato fries. If I’m cooking just 1 how much oil do I need? Maybe just 1/2 tbsp does the amount of oil make it soggy or crisper?